Several regulars at the Cycle Show, nee Rally, said that things have changed quite a lot over the years, but with nothing to compare it with we thoroughly enjoyed our weekend on the Knavesmire. By all accounts, the biggest improvement this year was the weather – it was glorious. Meeting at the Minster on Sunday morning to experience the bikes, the bells and the parade back to the racecourse in the sunshine was quite special too. Certainly an affordable weekend – £16 each for three nights of camping including entry to the show, along with a bar and organic food just a stone’s throw from the tent, it seemed pretty good value to me. The cycle route alongside the river made popping into the city centre worthwhile in itself. And running south of the racecourse is NCN route 65 which contains an educational 10km scale model of the solar system. Saturday evening we rode out to Saturn on Peter Eland’s Velovision ride to the Blacksmith’s Arms in Naburn for a bite, a pint and to catch up with friends – there’s relaxing! In the show itself there were the usual cycle apparel, component and tyre stalls, and of course complete bikes for sale. Not a bad range, most types of cycle were covered. Some of you may remember the lovely graphic styling of Bike Culture Quarterly and its Encycleopedia back in the 90s? The community interest company Get Cycling seems to be the latest venture of the same group and they had some inclusive cycles on show including electric assist trikes. 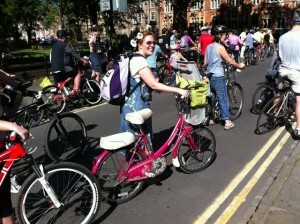 Get Cycling are based in York and have inclusive cycles for sale and hire. Next time we’re up there we’ll definitely drop in. Our main reason for coming to York though was for the opportunity to meet up with ICF members in the North and it was great to see Jean, aka bicigran, as planned. Jean brought along a suggested location for a meet in Northumberland too, so when Nobby’s back on his bike we can plan a trip up there. Still searching for an electric solution that can be swapped between bikes to give her more independence in the hills at home and in Spain, Jean visited Peter Eland at the Velovision stand to see what’s going on in the Electric Bike world. 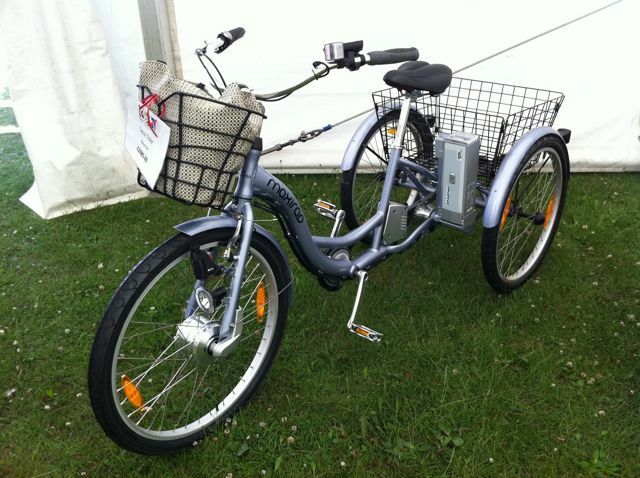 Which reminds me, I have copies of the second edition of Electric Bike if anyone wants the printed version. As well as pre-arranged get-togethers we also had some chance encounters with interesting folk during the weekend. Peter from York is an above knee amputee and like me uses a swinging crank on the prosthetic side. Look carefully in the picture and you’ll see that the cranks appear to be at right angles to each other rather than diametrically opposite. The crank facing us is made to Peter’s own specification and screws into the thread normally used for a crank puller. This means he can easily remove it and fit it to other bikes; when abroad for instance. Peter has a complication that means he can’t flex his leg at the hip on his prosthetic side – in fact he can’t sit in a chair when wearing the prosthesis. The swinging crank always hangs in the same position, his prosthetic foot stands on the pedal and he pedals only with his left leg. Peter mounts the bike in the “classic” way – he puts his good left foot on the pedal, scoots along using the prosthetic leg which he then swings over the rear rack to stand on the pedal of the swinging crank, pedalling off using his left leg. It’s a very smooth manoeuvre. He uses a plastic toe clip on the left side to enable him to bring the left crank up and round, and he has a single bungee arrangement to attach his two walking sticks to the bike. Simple and effective. Camped at the end of our row in the lightweights was Mark from Rotherham sporting these racing stickers on the fairing of his trike. Mark broke a hip badly on ice during a cold spell early in the year and is still in a lot of discomfort walking much distance at all. 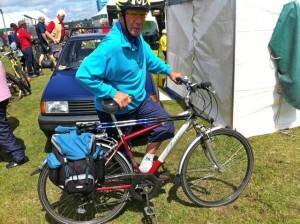 However, riding a trike is a different matter and he rode up from Rotherham with his camping gear. Mark’s panniers are worth a look too, you can see the pictures here on the CTC forum. 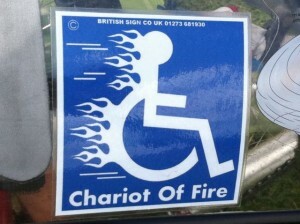 This entry was posted in Inclusive Cycling Forum and tagged bikes, camping, disability, show, words, york on Tue 12 Jul 2011 by kevin hickman.